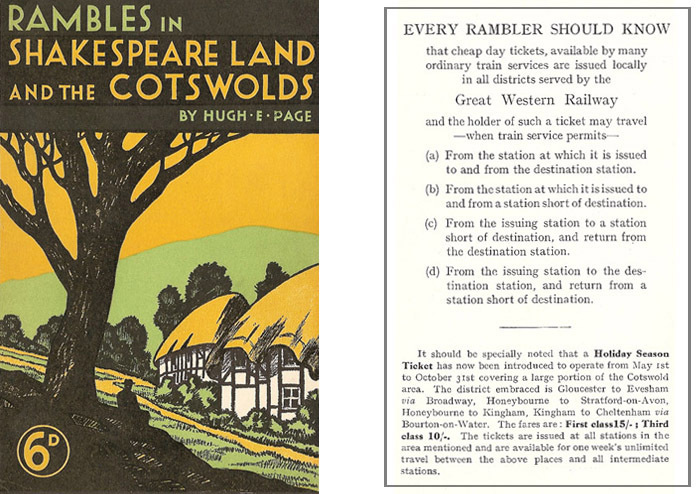 The GWR's book on rambles together with information on purchasing a holiday season ticket and how to use tickets to arrive at and depart from different stations. The Cotswolds and the Shakespeare Country attracts and fascinates most people, especially those who walk, and it is only by walking that the inner recesses of the area can be thoroughly explored. Apart from its associations, its attraction consists chiefly in a happy combination of natural and architectural beauty, included in the former being the wonderful views from the breezy health-giving hills and the charm of the deep and delightful flower-strewn valleys, particularly that of the Windrush, and in the latter the old-world and un-spoiled villages, on the houses and churches of which were lavished the love and skill of an artistic bygone age.